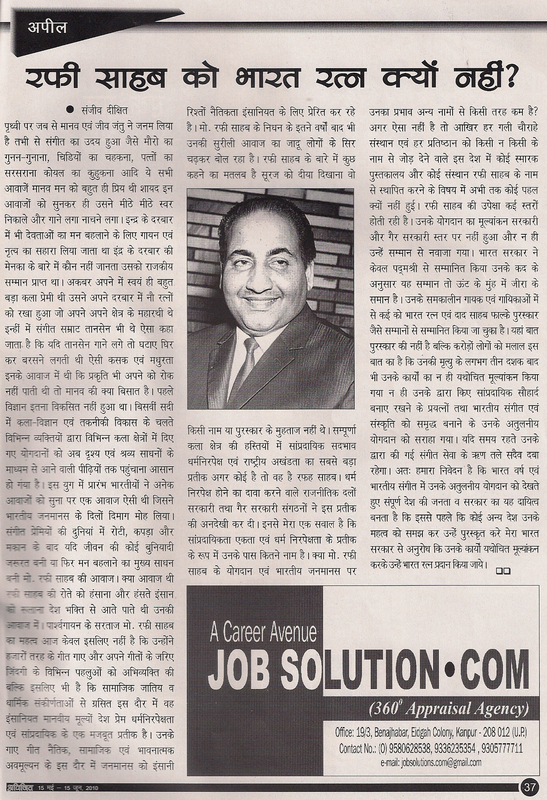 By Mr. Sanjeev Kumar Dixit and Gurbeer Singh from Lucknow. Rafi Sahab Ko Bharat Ratna Kyon Nahin? I have posted the letter requesting Bharat Ratna on 1st July 2010 to our respected PM Dr. Manmohan Singh, Mrs. Sonia Gandhi, Mr. Rahul Gandhi, Mr. Ramvilas Paswan and Mr. Navjot Singh Sidhu. Navjot ji is a MP (BJP) from Amritsar which is the land of birth of our beloved Rafi Sahab,therefore requested Sidhu ji to please put our demand in parliament as well as in media. This letter also has been published in the article form in a magazine “Avijit” of lucknow and I am trying to publish in news papers also. I am sending the scanned copy of the page of that magazine. Please click on the image below to read the article. I want that everybody in this forum and many more RAFI BHAKTS download these letters and send to the PM/PRESIDENT/MEDIA with ONLY THEIR individual name,VOTER ID and signature from different part of the country as well as from entire world .We must have to send too many letters as many as possible to PM/PRESIDENT/MEDIA OR ANY OTHER RAFI FANS LIKE MR. RAHUL GANDHI, MR. LALKRISHNA ADWANI, MR. RAMVILAS PASWAN & MR. NAVJOT SING SIDHU etc. So friends, please start to send these letters INDIVIDULY from today and inspire others to do so. We want to send many letters to the PM/PRESIDENT/MEDIA. FORMAT OF THESE LETTERS MAY BE SAME, IT SHOWS THAT WE ARE ONE ON THIS PLATFORM. Indian Youth Congress, #5 Raisina Road, New Delhi – 110001, India. A public Grievance Officer has been nominated in each Division of the Ministry as the Nodal Officer to monitor the progress of the redressal of Public Grievances relating to the respective Division..
REQUEST- PL SEARCH MORE CONTACT ADDRESSES OF MEDIA AND LEADERS AND SEND THE LETTERS TO THEM. This entry was posted on Monday, July 5th, 2010 at 5:25 pm	and is filed under Meri Awaaz Suno. You can follow any responses to this entry through the RSS 2.0 feed. You can leave a response, or trackback from your own site. 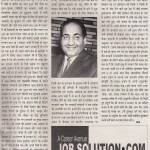 I am one of the the fan of Rafi Saheb since my childhood, I followed my mom and dad as they are Rafi fans too. I am singing and performing programmes of Rafi saheb all over the world. Rafi saheb deserves for Bharat Ratna not only for his singing but his whole life which he givened humanity to India, its citizens and to this World. Each and every word of Rafi saheb teaches the love to everyone in all subjects he practiced for the way of life totally whatever in this world. 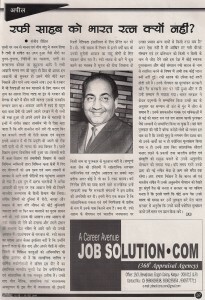 Like millions of God’s messengers came, RAFI Saheb is also a messenger from GOD TO THE PEOPLES OF WORLD. sanjiv dixit ji, i am thankful to you for your effort and i am also going to send the letters from today. but, why is it that even after rafi having so many supporters, he is not getting bharat ratna? he was better than all the singers who got bharat ratna.why the government is not taking any action? why the government is not responding to our request letter? rafi ji ko kab bharat ratna milega?I REALLY WANT HIM TO GET AS EARLY AS POSSIBLE.sanjiv ji, i would be grateful if you clear my doubts..im also a great fan of rafi ji. Many thanks for your huge support on this issue. you said very very true.We must have to write again to the authorities for this issue. rafi saahab really deserves bharat ratna. if freedom fighters can get award after death, then why not rafi saahab? if lataji can get then why not rafi saahab? he was a better singer than lataji. rafi saahab was not only a gifted singer, but a good person also.it is my request from the bottom of the heart to give him bharat ratna..i m seeing this letter late. but i wil definitly write letter to the above mentioned address.